Always wanted to be a certified scuba diver? Here’s your chance. At the completion of this PAID open water scuba diving course you will be a certified PADI Open water diver licensed to scuba dive around the world. 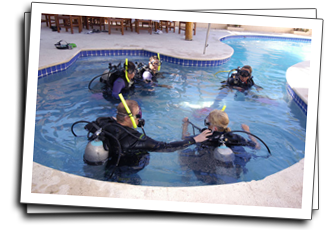 This course includes knowledge development, scuba skills confined water dives, and open water dive. Course Duration: 3 to 4 days and 4 open water dives. Prerequisites: The minimum age requirement is 10 years and a good physical condition. If there are any health concerns, there must be a doctor’s letter of approval attached. After successfully completing this course, the diver will be awarded a PADI Open Water Certification. This certification is accepted around the world and can be presented to any dive center as proof of scuba diving certification. Description: Do your open water diver classroom and pool work at home. Complete all your dives in the warm, beautiful Caribbean. Description: If it has been a while since your last dive, or you want to brush up on your skills, this course is for you. Our 2-hour course includes review of open water skills and techniques in confined water and a one-tank ocean dive.